Everyone hates ads; they're annoying, slow down web pages and apps, play loud sounds suddenly, force you to wait to watch the video you want to see, display not-safe-for-work content at uncomfortable moments, and sometimes even carry malware. Nearly a quarter of all requests are for ads or tracking which means that ads are additionally eating up quite a lot of the limited data volume available to mobile users. Because of all of these abuses of the web and app mediums for advertising, many people seek methods to block ads. Unfortunately ad-blocking on Android devices has been very limited, at least until now. Bulgarian developer, Sava Georgiev, recently released a new Android app called Block This! available for free in the GooglePlay store. The app blocks ads, not only while browsing the web, but also in apps (like Spotify audio ads for example). Additionally the app blocks tracking traffic and tracking cookies. There is also a monthly subscription available which allows access to faster servers and blocks traffic from domains known to distribute malware. The app blocks ads in all apps and even blocks video ads, tracking requests (typically used for targeting ads), malware-serving domains, and it even has the potential to increase browsing speeds (this is due to the fact that uses its own domain name server which may be faster than the one your ISP provides). The app can additionally have the side-effect of reducing your data usage by up to 25%! There are of course already numerous other ad-blocking apps out there, but what makes this one special is that it blocks the traffic across all apps (unlike AdBlock Browser), and it doesn't require your device to be rooted. The app works by creating a local VPN (virtual private network) on the device which all traffic is routed through. The VPN is configured to use a custom DNS (domain name server) instead of the default DNS which comes from the data provider. A domain name server is used to determine which IP a domain name (i.e. the base hostname requested such as www.google.com) should point to. 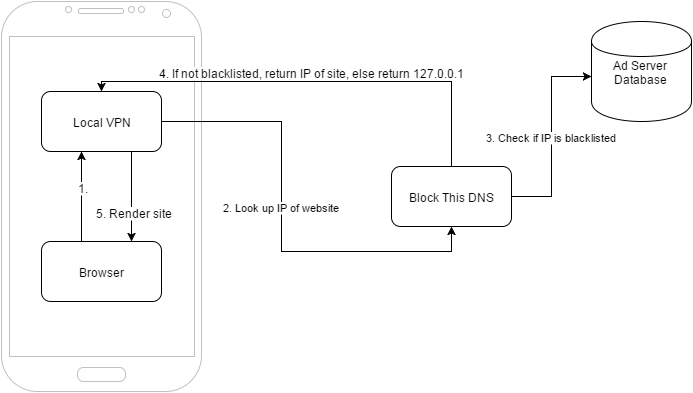 The BlockThis DNS will check if the requested domain is listed in its database of ad servers and if so it will return the IP 127.0.0.1; this is known as the "loopback address" and points to your localhost. When the device attempts to request the ad from your localhost it will receive a "not found" exception and then continue on with loading the content. The app already has over 200 thousand downloads since it was released in August, 2015. According to the developer, so far his servers have received 305 million requests, and of those 124 million were ads/tracking/malware. The app has also received a lot of attention in Bulgarian media ranging from popular IT websites such as pcworld.bg to print newspapers. I can definitely recommend checking it out in the Google Play Store.